Minaiyan, M., Karimi, F., Ghannadi, A. (2015). Anti-inflammatory effect of Pistacia atlantica subsp. kurdica volatile oil and gum on acetic acid-induced acute colitis in rat. Research Journal of Pharmacognosy, 2(2), 1-12. M. Minaiyan; F. Karimi; A. Ghannadi. "Anti-inflammatory effect of Pistacia atlantica subsp. kurdica volatile oil and gum on acetic acid-induced acute colitis in rat". 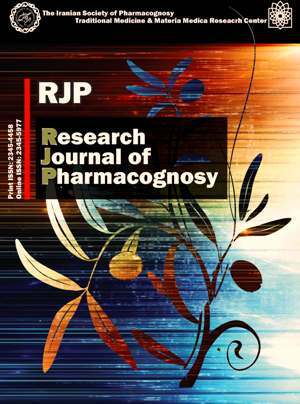 Research Journal of Pharmacognosy, 2, 2, 2015, 1-12. Minaiyan, M., Karimi, F., Ghannadi, A. (2015). 'Anti-inflammatory effect of Pistacia atlantica subsp. kurdica volatile oil and gum on acetic acid-induced acute colitis in rat', Research Journal of Pharmacognosy, 2(2), pp. 1-12. Minaiyan, M., Karimi, F., Ghannadi, A. Anti-inflammatory effect of Pistacia atlantica subsp. kurdica volatile oil and gum on acetic acid-induced acute colitis in rat. Research Journal of Pharmacognosy, 2015; 2(2): 1-12. 1Department of Pharmacology & Toxicology, School of Pharmacy and Pharmaceutical Sciences, Isfahan University of Medical Sciences, Isfahan, Iran. Background and objectives: Baneh tree or Pistacia atlantica subsp. kurdica is an endemic plant of Iran which belongs to Anacardiaceae family. It has various traditional uses including astringent and anti-diarrheal as well as improving some of the symptoms of gastrointestinal upsets. In this study we decided to investigate the effects of various fractions of baneh gum with different doses in an animal model of ulcerative colitis as one of the important chronic inflammatory bowel diseases of the gastrointestinal tract. Methods: The volatile oil and aqueous baneh gum suspensions were prepared and the constituents of the volatile oil were analyzed by GC/MS. They were used to treat colitis induced by acetic acid 4% in rats. Three doses of gum (100, 200 and 400 mg/kg) were administered both orally (p.o.) and intra-rectally (i.r.) while volatile oil was administered p.o. with doses 100, 200 and 400 µl/kg for four constitutive days. Anti-inflammatory effects of the test compounds were compared with oral prednisolone and hydrocortisone enema. Wet colon weight/ length ratio and tissue damage scores and area as well as indices of colitis and tissue myeloperoxidase activity were evaluated for each specimen. Results: Alpha-pinene was the main constituent of baneh volatile oil (41.23%). We observed therapeutic effects in applied doses of oral gum as well as volatile oil to reduce all indices of colitis and myeloperoxidase activity. Unlike the oral form of gum, its rectal administration was not significantly effective to improve colitis. Conclusion: This research has proved the anti-inflammatory potential of oral gum of Pistacia atlantica subsp. kurdica and its volatile oil in an experimentally induced colitis. Katzung BG, Masters SB, Trevor AJ. Basic and clinical pharmacology. 12th ed. New York: McGraw Hill Publications, 2012. Summers RW. Novel and future medical management of inflammatory bowel disease. Surg Clin North Am. 2007; 87: 727-741. Jagtap AG, Shirke SS, Phadke AS. Effect of polyherbal formulation on experimental models of inflammatory bowel diseases. J Ethnopharmacol. 2004; 90: 195–204. Bodger K. Cost of illness of Crohn’s disease. Pharmaconomics. 2002; 20: 639-652. Kazemi M, Eshraghi A, Yegdaneh A, Ghannadi A. Clinical pharmacognosy, a new interesting era of pharmacy in the third millennium. Daru J Pharm Sci. 2012; 20: 18. Paiva LA, Gurgel LA, De Sousa ET, Silveira ER, Silva RM, Santos FM, Rao VS. Protective effect of Copaifera langsdorffii oleo-resin against acetic acid-induced colitis in rats. J Ethnopharmacol. 2004; 93: 51–56. Minaiyan M, Ghannadi A, Etemad M, Mahzouni P. A study of the effects of Cydonia oblonga Miller (quince) on TNBS-induced ulcerative colitis in rats. Res Pharm Sci. 2012; 7: 103–110. Minaiyan M, Ghannadi A,Mahzouni P,Jaffari-Shirazi E. Comparative Study of Berberis vulgaris fruit extract and berberine chloride effects on acetic acid-induced colitis in rats. Iran J Pharm Res. 2011; 10: 97–104. Keshavarz A, Minayian M, Ghannadi A, Mahzouni P. Effects of Carum carvi L. (Caraway) extract and essential oil on TNBS-induced colitis in rats. Res Pharm Sci. 2013; 8: 1-8. Minaiyan M, Asghari GH, Taheri D, Saeidi M, Nasr-Esfahani S. Anti-inflammatory effect of Moringa oleifera Lam. seeds on acetic acid-induced acute colitis in rats. Avicenna J Phytomed. 2014; 4: 127-136. Minaiyan M, Ghannadi A, Asadi M, Etemad M, Mahzouni P. Anti-inflammatory effect of Prunus armeniaca L. (apricot) ameliorates TNBS-induced ulcerative colitis in rats. Res Pharm Sci. 2014; 9: 225-231. Abed A, Minaiyan M, Ghannadi A, Mahzouni P, Babavalian MR. Effect of Echium amoenum Fisch. et Mey, a traditional Iranian herbal remedy in an experimental model of acute pancreatitis. ISRN Gastroenterol. 2012; 3: 1-7. Minaiyan M, Sajjadi SE, Naderi N, Taheri D. Anti-Inflammatory Effect of Kelussia odoratissima Mozaff. hydroalcoholic extract on acetic acid- induced acute colitis in rats. J Rep Pharm Sci. 2014; 3: 28-35. Minaiyan M, Ghannadi A, Mahzouni P, Nabi-Meibodi M. Anti-ulcerogenic effect of ginger (rhizome of Zingiber officinale Roscoe) hydroalcoholic extract on acetic acid-induced acute colitis in rats. Res Pharm Sci. 2008; 3: 15-22. Ghahreman A. Flora of Iran. Tehran: Research Institute of Forests and Rangelands Publications, 1995. Amin Gh. The most common traditional medicinal plants in Iran. Tehran: Research Council of Tehran University of Medical Sciences, 2005. Sharifi MS, Hazell SL. GC-MS analysis and antimicrobial activity of the essential oil of the trunk exudates from Pistacia atlantica kurdica. J Pharm Sci Res. 2011; 3: 1364-1367. Sharifi MS, Hazell SL. Isolation, analysis and antimicrobial activity of the acidic fractions of mastic, kurdica, mutica and cabolica gums from genus Pistacia. Glob J Health Sci. 2012; 4: 217-228. Razi M. Al-Hawi. Vol. 21. Afsharipour S. (Trans.) Tehran: Iranian Academy of Medical Sciences Publications, 2005. Ibn Sina. Canon of Medicine. Translated by: Shrafkandi A. Tehran: Soroush Press, 2005. Aghili MH. Makhzan-al-Advia. Rahimi R, Shams Ardekani MR, Farjadmand F. (Trans.) Tehran: Tehran University of Medical Sciences, 2009. Taran M, Mohebali M, Esmaeli J. In vivo efficacy of gum obtained Pistacia atlantica in experimental treatment of cutaneous leishmaniasis. Iran J Public Health. 2010; 39: 36-41. Hamdan II, Afifi FU. Studies on the in vitro and in vivo hypoglycemic activities of some medicinal plants used in treatment of diabetes in Jordanian traditional medicine. J Ethnopharmacol. 2004; 93: 117-121. Kasabri V, Afifi FU, Hamdan I. In vitro and in vivo acute antihyperglycemic effects of five selected indigenous plants from Jordan used in traditional medicine. J Ethnopharmacol. 2001; 133: 888-896. Rezaei PF, Fouladdel S, Hassani S, Yousefbeyk F, Ghaffari SM, Amin G, Azizi E. Induction of apoptosis and cell cycle arrest by pericarp polyphenol-rich extract of Baneh in human colon carcinoma HT29 cells. Food Chem Toxicol. 2012; 50: 1054-1059. Benamar H, Rached W, Derdour A, Marouf A. Screening of Algerian medicinal plants for acetylcholinesterase inhibitory activity. J Biol Sci. 2010; 10: 1-9. Mahmoudi M, Ebrahimzadeh MA, Nabavi SF, Hafezi S, Nabavi SM, Eslami SH. Anti-inflammatory and antioxidant activities of gum mastic. Eur Rev Med Pharmacol Sci. 2010; 14: 765-769. Kaliora AC, Stathopoulou MG, Triantafillidis JK, Dedoussis GV, Andrikopoulos NK. Chios mastic treatment of patients with active Crohn’s disease. World J Gastroenterol. 2007; 13: 748-753. Mehregan I, Ghannadi A. Essential oil analysis of Haussknechtia elymaitica Boiss. fruits, an endemic plant from Iran. Rev Chim. 2013; 64; 81-82. Shokoohinia Y, Yegdaneh A, Amin G, Ghannadi A. Seasonal variations of Laurus nobilis L. leaves volatile oil components in Isfahan, Iran. Res J Pharmacogn. 2014; 13: 1-6. Ghannadi A, Bagherinejad MR, Abedi D, Jalali M, Absalan B, Sadeghi N. Antibacterial activity and composition of essential oils from Pelargonium graveolens L’Her and Vitex agnus-castus L. Iran J Microbiol. 2012; 4: 171-176. Kabouche A, Ghannadi A, Kabouche Z. Thymus ciliatus- The highest thymol containing essential oil of the genus. Nat Prod Commun. 2009; 4: 1251-1252. Adams RP. Identification of essential oil components by GC/MS spectroscopy. Carol Stream: Allured Publishing Co., 1995. Committee for the update of the guide for the care and use of laboratory animals. Guide for the Care and use of Laboratory animals. Washington: The National Academies Press, 2010. Mascolo N, Izzo AA, Autore G, Maiello FM, Di Carlo G, Capasso F. Acetic acid-induced colitis in normal and essential fatty acid deficient rats. J Pharmacol Exp Ther. 1995; 272: 469-475. Morris GP, Beck PL, Herridge MS, Depew WT, Szewczuk MR, Wallace JL. Hapten-induced model of chronic inflammation and ulceration in the rat colon. Gastroenterology. 1989; 96: 795-803.
 Cooper HS, Murthy SN, Shah RS, Sedergran DJ. Clinicopathologic study of dextran sulfate sodium experimental murine colitis. Lab Invest. 1993; 69: 238-249. Dieleman LA, Palman MJ, Akol H, Bloemena E, Pena AS, Meuwissen SGM, Van Rees EP. Chronic experimental colitis induced by dextran sulfate sodium (DSS) is characterized by Th1 and Th2 cytokines. Clin Exp Immunology. 1998; 114: 385-391. Bradley PP, Priebat DA, Christensen RD, Rothstein G. Measurement of cutaneous inflammation: estimation of neutrophil content with an enzyme marker. J Invest Dermatol. 1982; 78: 206-209. Sharon P, Stenson WF. Metabolism of arachidonic acid in acetic acid colitis in rats: similarity to human inflammatory bowel disease. Gastroenterology. 1985; 88: 55-63. Murano N, Murano M, Ishida K, Kawakami K, Abe Y, Inoue T, Morita E, Yasumoto S, Toshina K, Nishikawa T, Ito S, Hirata I, Katsu K. Therapeutic effect of SHI-219, a novel water soluble prodrug of EG626 (phtalazinol), on mouse dextran sodium sulfate -induced colitis. Bull Osaka Med Coll. 2006; 52: 69-79. Haghdoost F, Baradaran Mahdavi MM, Zandifari A, Sanei MH, Zolfaghari B, Javanmard SH. Pistacia atlantica resin has a dose-dependent effect on angiogenesis and skin burn wound healing in rat. Evid Based Complement Alternat Med. 2013; 893425: 1-8. Benhammou N, Atik Bekkara F, Kadifkova Panovska T. Antioxidant and antimicrobial activities of the Pistacia lentiscus and Pistacia atlantica extracts. Afr J Pharm Pharmacol. 2008; 2: 22-28. Bozorgi M, Memariani Z, Mobli M, Salehi Surmaghi MH, Shams Ardekani MR, Rahimi R. Five Pistacia species (P. vera, P. atlantica, P. terebinthus, P. khinjuk, and P. Lentiscus): a review of their traditional uses, phytochemistry and Pharmacology. Sci World J. 2013; 2013: 219815. Mecherara-Idjeri S, Hassani A, Castola V, Casanova J. Composition of leaf, fruit and gall essential oils of Algerian Pistacia atlantica Desf. J Essent Oil Res. 2008; 20: 215-219. Delazar A, Reid RG, Sarker SD. GC-MS analysis of the essential oil from the oleoresin of Pistacia atlantica var. mutica Chem Nat Comp. 2004; 40: 24-27. Barrero AF, Herrador MM, Arteaga JF, Akssira M, Mellouki F, Belgarrabe A, Blázquez MA. Chemical composition of the Essential oils of Pistacia atlantica Desf. J Essent Oil Res. 2005; 17: 52-54. Giuseppe R, Baratta MT. Antioxidant activity of selected essential oil components in two lipid model systems. Food Chem. 2000; 69: 167-174. Asbaghian S, Shafaghat A, Zarea K, Kasimov F, Salimi F. Comparison of volatile constituents, and antioxidant and antibacterial activities of the essential oils of Thymus caucasicus, T. kotschyanus and T. vulgaris. Nat Prod Commun. 2011; 6(1): 137-140. Ramezani M, Khaje-Karamoddin M, Karimi-Fard V. Chemical composition and anti–Helicobacter pylori activity of the essential oil of Pistacia vera. Pharm Biol. 2004; 42: 488–490. Paraschos S, Magiatis P, Gousia P, Economou V, Sakkas H, Papadopolou C, Skaltsounis AL. Chemical investigation and antimicrobial properties of mastic water and its major constituents. Food Chem. 2011; 129: 907-911.